This week we have been on exams with a fresh start coming up next week. Once I started inputting the marks and printed them out, having 2 students failing, 1 of them it was the second time he failed. It is a horrible feeling when you know they will have to do it all over again a second (or third time). Where did they go wrong? They knew this was happening and from what all the teachers do before hand to help them but what can be done to fix it? You can call home, offer extra help, give assignments a second, third, fourth time, refer to the VP, refer to Guidance, make classes fun, and still the problem exists. The main issue is the attendance, being late and falling behind or missing class after class is detrimental to the success in a course. What home situations are these students going through or outside influences that cause them to miss class? Or could it be something in the school that is forcing them out? Did they meet the expectations of the curriculum? Or learn enough science to prepare them for life? All these questions come up and when you have 30 students per class they can all be answered very differently as they have all had a different starting point and different pathways to follow. I always feel personally responsible when a student fails. With semester 2 starting, we all need to look at what we are doing and how we can engage all students. We can implement early all the supports, instil trust and a solid organized plan as school schedule may be the only consistent thing in the students’ lives. I look forward to the new group of students and especially the grade 9 science class where my goal is to make science as fun, exciting and useful for them as possible and get them to really start exploring the world around them! Education is one amazing career choice!!! You know you love your career when the thought of returning to work after the holidays is a positive one! Thinking of walking back into school Monday and being with the students is something I have missed over the holidays. I know it sounds a bit corny but the students are the reason I am doing this job in the first place, so might as well get excited about them. It isn’t always about titrations, atomic theory and how many electrons calcium has, but the experiences within the classroom themselves. The content can be read from a book and a good teacher should not just be another source of content. We should be the ones engaging students, sparking interest and turning over the control to them and be a guide. Let them create content and acknowledge their previous knowledge. This 2 week break has been a great time to spend with family and take time for myself, but it has also been a great time of self-discovery. After being inspired by fellow teachers, graduate students and professors a like, I have taken time to really think about my teaching career and graduate level schooling. I think the two are so highly infused within each other that I can’t look at them separate. I have taken to making this blog and establishing an online identity (thanks @monicaannebatac) and also making connections with those in my field. 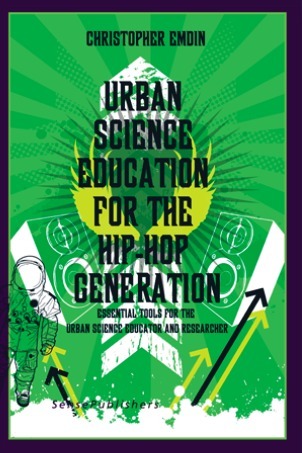 Having read Chris Emdin’s book Urban Science Education for the Hip-Hop Generation (@chrisemdin), I decided to message him to share that his work has helped with my own work. I received an immediate response and felt very inspired that someone with such a wealth of experience and a leader in urban science education took the time to acknowledge my work. Talk about technology bringing us closer!